-_- There Dark Elves high ranked Dark Elves for that matter, marrying cousins or brother sister comes with the whole blue blood thing? Sorry to be so blunt but this a dark world and well Mike Lee handled it in a really subtle way took me a few readings of Darkblades adventures to get the nastiness of the Dark Elves and you know what by the Dark Mother I loved it gimmes more of that darkness as like Marduk in 40k competent villains, villains as 'heroes' that I can get behind and understand there motivations, oh and nicely thought out social structure and world building, yep more please oh and that damned rouge Hauclir (how do you say his name?) personal favorite bit Mike put in was the sword length social exclusion thingy (its late ok?) nice little idea given how Druchi society works. "Abandon your fear. Look forward. Move forward and never stop. You'll age if you pull back. You'll die if you hesitate." "From iron cometh strength. From strength cometh will. From will cometh faith. From faith cometh honour. From honour cometh iron." "And may it ever be so"
sam vimes wrote: -_- There Dark Elves high ranked Dark Elves for that matter, marrying cousins or brother sister comes with the whole blue blood thing? Sorry to be so blunt but this a dark world and well Mike Lee handled it in a really subtle way took me a few readings of Darkblades adventures to get the nastiness of the Dark Elves and you know what by the Dark Mother I loved it gimmes more of that darkness as like Marduk in 40k competent villains, villains as 'heroes' that I can get behind and understand there motivations, oh and nicely thought out social structure and world building, yep more please oh and that damned rouge Hauclir (how do you say his name?) personal favorite bit Mike put in was the sword length social exclusion thingy (its late ok?) nice little idea given how Druchi society works. I don't want to be the Topic Nazi, but this isn't the best thread to discuss the Dark Elf book. If people want to discuss that book it's probably best either to start a new topic or take it to the "elven pantheon" thread which is in reaction to the new army book. Either that's a sign Games Workshop has absolutely no problem with their supposed superstar games designer ripping off ideas someone and trying to pass it as their own, or it's an indication of who is writing this one. Either way it's not a good sign. Bellarius wrote: Either that's a sign Games Workshop has absolutely no problem with their supposed superstar games designer ripping off ideas someone and trying to pass it as their own, or it's an indication of who is writing this one. Either way it's not a good sign. Plagiarism? I'm definitely missing a piece of the logic. Xisor wrote: Plagiarism? I'm definitely missing a piece of the logic. That entire event takes place at the exact same time at the conclusion to the Soul Drinkers series with almost the exact same plot. A madman attempts to take control of the Phalanx by summoning a horde of daemons onto the vessel, rout the forces there and take it for himself in his quest to cripple humanity. Ignoring the fact that the original actually made sense and was relatively well written by comparison, the new book goes out of its way to ensure the original story could never have happened. It's one of about three such instances within the Sentinels of Terra codex, where mysteriously specific retcons make an Imperial Fists related story impossible and then oddly similar plots play out with the new characters involved..
Lord of the Night wrote: He gave Malekith an ex-wife, and Morathi no longer wants her son. She wants Tyrion. I've finally managed to read the fluff sections in detail, and I think this is a bit of an oversimplification. For starters Morathi "wanting" Malekith was only ever subtext and never stated outright; nor is it indicated here that this is no longer the case. She starts to get frustrated with Malekith at one point because of his lethargy, but there's no indication that when he shakes that off she doesn't remain loyal to him. 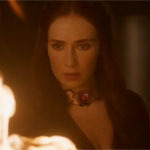 Her pursuit of Tyrion is during Malekith's absence when she starts to believe he isn't coming back. The decision to give Malekith an ex-wife is a bit strange, but actually makes perfect sense (as does Morathi's Tyrion obsession, in fact). The only reason it seems odd now is that it hasn't been mentioned before (e.g. in the Malekith novel) but there is a lot of blank space to fill in his life history. Frankly it's quite refreshing to have a faction leader in the army book who is explicitly non-celibate. What frustrates me more is that the dates given in the timeline don't match up with the High Elf ones. Sea Lord Aislinn washes up on the coast of Ulthuan a year before Lokhir Fellheart sinks his ship and leaves him for dead. Chaos did it. Or, more likely, they did the maths wrong on the timeline. I'm pretty sure it's not plagiarism if it's your own IP you're apparently plagiarising. Indeed. As Belle puts it, it sounds like textbook undermining; incredibly shoddy teamwork. But that's certainly not 'ripping off'. Athelassan wrote: I've finally managed to read the fluff sections in detail, and I think this is a bit of an oversimplification. Well I haven't actually read the new DE army book, I read some cliff notes by somebody who had back in October. 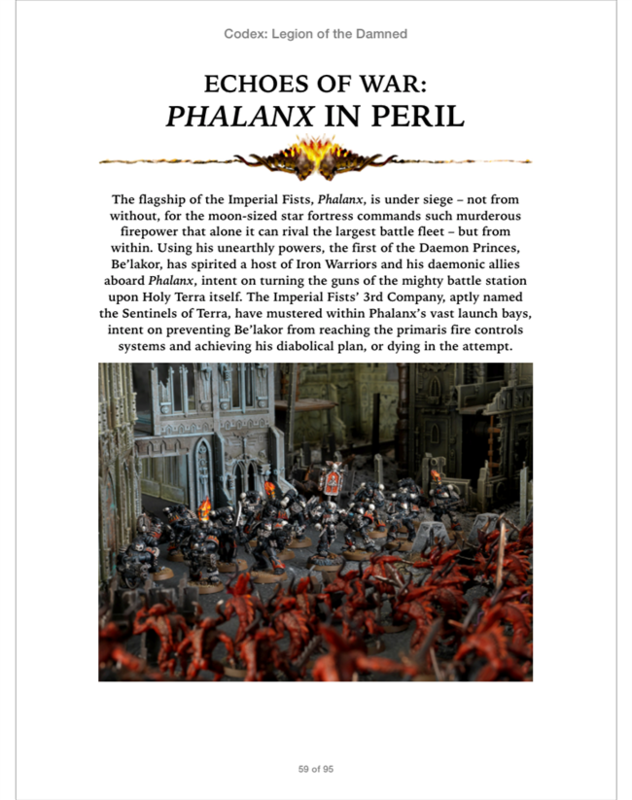 Would really like to read it though, but I won't buy an army book for an army I don't play and I can't find a pdf of it with the lore sections. Xisor wrote: ndeed. As Belle puts it, it sounds like textbook undermining; incredibly shoddy teamwork. But that's certainly not 'ripping off'. Both works feature an ending to a lengthy story the writers created following their characters. Both featured them being manipulated from afar by foreign forces. Both feature the end goal of a Chaos allied madman to be the Phalanx. Both such madmen seek to use the Phalanx to topple humanity and utilise it for their own goals of remaking their kind. Both madmen make pacts with daemon princes and manage to summon the hordes of a multitude of gods onto the vessels. Both feature the use of a Warp gate. Both take place in exactly the same year as one another. Moment for moment, each story seems to match up with one another to extreme similarity. The difference is that whereas Counter actually built towards the event, worked into the story how it could take place and used it as an endgame, Ward suddenly slaps this on at the end of the timeline. Almost as if he saw the idea and wanted it for himself without putting in the effort to have it make sense. Furthermore, atop this we have all the other tales which are mysteriously retconed and have Ward's characters play out events from their plots. Captain Taelos is suddenly turned into a non-person with someone else leading his company, leaving Lysander open to carry out a suspiciously similar plot. One in which he is demoted and tasked with rebuilding the force left in ruins under his command, only this one lacked Sons of Dorn's good qualities. Endevour of Will is suddenly reconned from existence by having Lysander elsewhere, when it was taking place, and suspiciously the book opts to have a very similar showdown between him and Shon'Tu onboard a Chaos afflicted vessel. Given Ward just turned them into the Black Templars Mk. 2, turned Lysander into an incompetent sociopath, turned their fortress into a barely operational heap of junk which the Iron Warriors almost steal out from under them, and showed a borderline obsession with noting down just how many Fists die, that is is extremely unlikely. Not to mention his sudden decision to have the Imperial Fists use "older and inferior" equipment by some stupid choice. I'd also say your words ring untrue. Whatever its failings, the Soul Drinkers series for the most part stuck to the canon. Counter certainly bent the rules at times but he at least remembered the Warp is dangerous to humans and treated most forces within them with respect. Certainly more than the Imperial Fists were shown by Matt "They can never be Ultramarines" Ward. Last edited by Bellarius on Tue Feb 25, 2014 4:09 pm, edited 1 time in total. This sort of Chinese whispers is how Ward-hate and the like gets out of proportion and control. A lot of Ward-hate seems somewhat circular. I don't know how it originally got started, but these days people just assume the worst and hate everything he does; any time he respects existing background it's a rip-off or lazy copy-pasting. If something good and original appears it was probably the work of someone else. And most of the time only the negatives get reported anyway. In this fists supplement any details on Asartes being on Terra beyind the ones we already know about, Wolfblades and Custodes? if i'm not mistaken,someone commented on your SoT review saying that's exactly the way they were described in C:Ultramarines. -BT hating librarians and all other psy because it shows they are trully fanatics.They are now the only ones with emperor champion,just because we need a unique unit for them. A lot of Ward-hate seems somewhat circular. I don't know how it originally got started, but these days people just assume the worst and hate everything he does; any time he respects existing background it's a rip-off or lazy copy-pasting. He deserves some of the hate,because he wrote some absurd stuff in the places where he put his hands (or,if not absurd,he presented it as badly as possible). Last edited by Fenris on Tue Feb 25, 2014 5:46 pm, edited 3 times in total. Fenris wrote: if i'm not mistaken,someone commented on your SoT review saying that's exactly the way they were described in C:Ultramarines. Yes, back in a day of yesteryear. Something we were supposed to have developed beyond, something we were supposed to have built upon and grown past, not devolved back into a crude, poorly conceived version of it. Those were they days back when the game was still an outright parody, a day when calling all other chapters inferior mimics of the Ultramarines. Something which, as time went by, the game progressively grew beyond until Ward's tripe was deemed irrefutably perfect by some halfwit executive. So what. Founding chapters can diverge from what their originals were, they can become different aspects and choose to take different paths from their successor. The time you are using to defend outright character assassination is a time when they consisted of many factions. Many were broken up into likeminded ones creating their successors, those who represented what the Imperial Fists now are became the Black Templars. I also don't see what this has to do with anything. Their status as a Scouring era legion does not excuse the lore's repeated attempts to pretend their siege mastery amounts to nothing nor copying and pasting traits from a long established successor. Especially when it squanders so much potential and renders so many stories non-canon. Then again perhaps that was the intent given what Ward blatantly pulled here, more for him to use in the future. None of which excuses Ward's efforts to rip off those works and try to pass them off as his own. They were also minor aspects re-introduced without utterly bulldozing through the old canon and trying to pretend nothing from the Second Edition onward never happened. You mean minor expansions and developments which actually gave them major background developments. Like the Index Astartes, the multiple novels, the various White Dwarf articles and major developments which made each factor more individuals and less copies of one another. The ones which made the Space Marines stand out from one another, and has proven to be far more effective at making their factions distinctive. There are no other long standing forces which even come close to succeeding in having the same individual popularity as the distinctive space marine forces. You are trying to argue that developing beyond "Ultramarines are the best, everyone copies them" into a more varied series of factions was a purely bad idea. Are you trying to waste time or actually making this a serious argument. Which was used to create a zealous faction in the vein of a knightly order and built into their basic personality. You're honestly trying to argue their basic core tenants, personal beliefs and very strategy should all be ignored in some simplified case of "they dun like psykers." I'm sure people who play Black Templars would disagree. Which is of course completely ignoring the fact the Imperium can only create terminator suits at slightly above the attrition rate and the situation which cased that loss in the first place. Also ignoring their unique mentality, chapter structure, relationships, approach to war and ideology. Yes, i'm sure all of that was nothing of value, just speak to all those Iron Hands players spitting blood over what Ward did to their chapter in Codex: Clan Raukaan. Which once again overlooks their history, unique traits, traditions and a multitude of other established aspects which fleshed them out. So you're not only arguing via the extreme simplification of fleshing out each faction, going out of your way to ignore vast swathes of major improvements and giving them an actual personality, you're also trying to use bad editing as a reason everything should go back to Second Edition. I repeat again, are you actually trying to make a serious argument here. I'd rather not waste time with someone intentionally putting together such a poorly constructed case as this. And you seem very determined to defend the single greatest example of how not to behave when writing alongside co-workers. Showing no respect for many factions, blatant plagarism, blatant favouritism and choosing to retcon entire forces into poor mimics of his personal favourite than actually be bothered to put the effort in to maintain a decades old identity. It's not a perfect work, it is a work which should be upheld as an example of everything to avoid when writing about Warhammer. Or are you next going to try and claim Henry Zou is unfairly maligned for his crimes? When you try to argue that someone reducing the game back several editions and destroying a decades old identity of a force is a good thing, you tend to be defending that person's actions. Especially when you follow it up with statements of how people are "going out of their way" to find reasons to have issue with this man's works. I'm sorry if you somehow don't think that's how it works. What was it that was the source of the 'Imperial Fists turnover Marines very quickly' idea? High death-rate, high-creation rate. I liked that. Very... inhuman, and yet agonisingly human. One of the finest hands played to the Fists in years. That was in Sentinels of Terra.